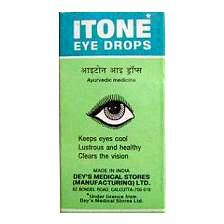 I was introduced to Itone ayurvedic eye drops at a National Ayurvedic Medical Association annual meeting. I found them so effective that I imported them from India. I'm a contact lens wearer and I spend all day on my computer, iPhone, reading, etc. and my eyes often get tired, red and dry. Since I started using Itone once in the morning and once at night (sometimes more frequently, if necessary), my eyes feel so much better! They're clear, bright and moisturized. I often use Itone drops while I'm wearing contacts and have not had any problem. Itone is a sterile preparation used for: strain, dryness, watering, redness, allergies, conjunctivitis and burning eyes. It also helps with irritation from air pollution, smoke, dust and other airborne irritants. Caution: Although it isn't a common reaction, I find these drops sting a little bit for a few seconds after putting them in. My eyes, however, are exceptionally sensitive and I feel the little bit of "burn" is entirely worth it for once the sensation has gone away, my eyes look and feel incredibly clear and hydrated. Obviously, if the burning sensation doesn't abate after 10-15 seconds, rinse your eyes with cool water and discontinue use. Nimba (Azadirachta Indica) 5% Sobhanjana (Moringa pterygosperma) 5% Bhringaraj (Eclipta alba) 5% Punarnava (Boerhaavia diffusa) 7.50% Nirgundi (Vitex negundo) 5% Satapatri (Rosa damascena) 7.50% Yamani (Carum copticum) 2% Haritaki (Terminalia chebula) 5% Vibhitaka (Terminalia belerica) 5% Dhatriphala (Emblica officinalis) 5% Haridra (Curcuma longa) 5% Karpuram (Camphora officinarum) 3% Pudina (Mentha sylvestris) 2% Madhu (Honey) 10% Ela (Elettaria cardamomum) 5% Swet Chandan (Santalum album) 5% Rakta Chandan (Santalum rubrum) 5% Hastisundi (Heliotropium indicum) 5% Tulsi Patra (Ocimum sanctum) 5%. Preservatives: Phenylethyl alcohol USP 0.05%, Benzalkonium Chloride Solution IP .02%.